Latest statistics from research firm Analysys show that tablet sales in China have slowed this year mainly because of weak sales of Apple’s iPad. Tablet sales reached 3.58 million in the second quarter of 2013, up 5.2 percent from the previous quarter. 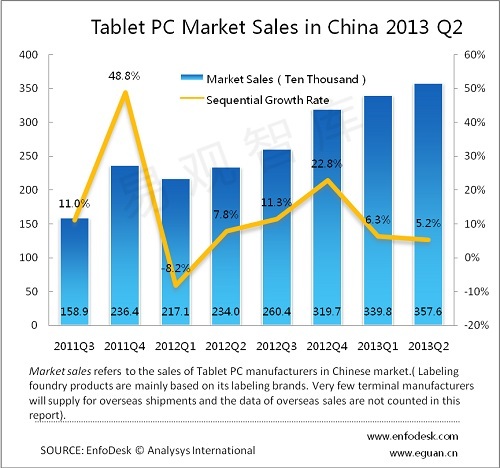 Comparatively, in the second quarter last year, tablet sales rose by 7.8 percent from the previous quarter. In the first quarter this year, sales hit 3.4 million, an increase of 6.3 percent from the preceding quarter. Analysys notes that among the three major tablet PC platforms, iOS declined “significantly”. It warns that it will be “difficult to suppress the trend of its market share being eroded” and that if Apple cannot launch a new tablet soon to attract consumers, Android’s market share will soon exceed that of iOS. Android has gained market share rapidly due to many manufacturers producing models that cover all consumer price groups, and Analysys notes that Samsung’s official release of the Galaxy Note 8.0 was warmly received by the market, dramatically increasing the overall sales of Samsung tablet devices. The sales of Windows-based devices were tepid despite the release of its Surface RT tablet and continuous price cuts, while domestic brands such as Taidian and Onda have made progress with their low-priced tablets.